Showing 1 - 9 of 9 articles tagged "Eric McCormack"
McCormack shared the news on Twitter that his Canadian-American post-apocalyptic sci-fi series won't be back for Season 4. Co-creator Max Mutchnick explains why last week's episode revisited the pivotal Season 3 moment. Debra Messing shared the photo of her new love on-screen love interest and his hilarious outfit. 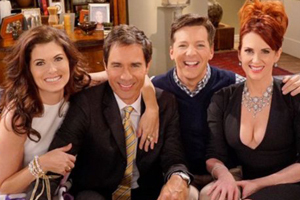 The Will & Grace star will continue pulling double duty, appearing on the Netflix sci-fi series for a third season. “The only thing that I asked for was that Grace be a feminist,” Messing said at the Tribeca TV Festival.